Allergy & Asthma Institute is a leader when it comes to diagnosing and treating allergic conditions in adults and children. Our family of providers and staff places the utmost importance on providing quality, effective care to our patients. 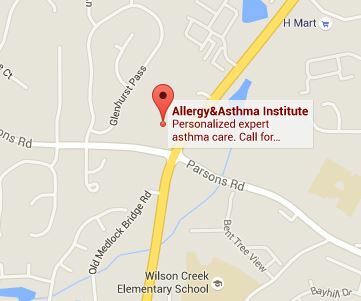 Please find more information about the services we offer at Allergy & Asthma Institute. Allergy skin testing is performed to evaluate many allergic conditions including allergic rhinitis (hay fever), asthma, food allergy, stinging insect allergy, some drug allergies, and some allergic skin disorders. In order to identify what airborne allergens or food substances you are allergic to, we generally perform a prick skin test. This involves applying a small amount of the substance to the skin on the arm or the back using a sterile, plastic device. A positive test results in an itchy spot “welt” about the size of a mosquito bite. The testing procedure takes 15-20 minutes. The pain associated with testing is often minimal. It is necessary to avoid antihistamines up to one week prior to the testing. Allergy testing can be done by a blood test as well. Blood testing is generally more expensive, involves a needle stick, and the results are not available for a week after a blood sample is obtained. There are certain circumstances where we may choose to perform blood testing instead of typical allergy skin testing. Allergy skin testing also allows us to obtain results while you are in the office and to develop a treatment plan at the time of your visit. Our spirometer links into our electronic medical record to allow us to digitally track your lung function and plot trends. This is a simple and painless test that only takes a few minutes. Patch testing is performed for evaluation of allergic skin disorders known as allergic contact dermatitis. An example of this is poison ivy allergy, or nickel allergy. This test involves applying the test substance to the back with hypoallergenic tape and leaving it in place for 48 hours. After the test patch is removed from the back, you will need to return in another 24 to 48 hours to read the test site. A positive reaction results in a localized rash at the test site. A positive test allows us to advise you on how to avoid what you are allergic to. You can read more about patch testing at www.truetest.com. Your treatment plan may include environmental, medical, and immunotherapeutic interventions. We focus on patient education and will take the time to answer your questions. Allergy shots help desensitize patients to the substances they are allergic to, called allergens, and build immunity or tolerance to these substances. Allergy shots are allergy serum customized for each patient. Injections usually begin with a very low dose of diluted allergy serum. Each week, the dose is increased until the full, or maintenance dose is achieved. Patients then may receive shots monthly.